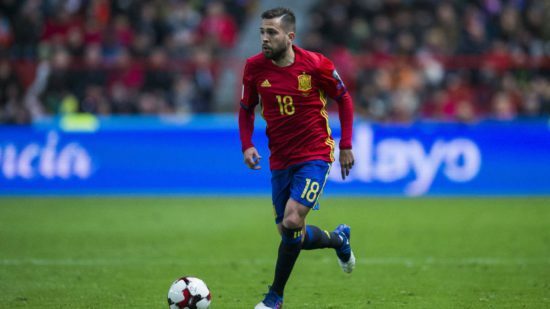 Manchester United boss, Jose Mourinho is keen to upgrade his options at left back and has reportedly identified Barcelona defender Jordi Alba as that player. The 28-year-old is wanted by the Portuguese tactician to add quality to his defence given the struggles of his current options at the back. The likes of Luke Shaw, Matteo Darmian and Daley Blind have all struggled to nail down that position leaving Mourinho to turn to veteran midfielder, Ashley Young who has since impressed upon his return from injury. Manchester Evening News reports that Mourinho is keen on the 28-year-old player but a major stumbling block will arise if United make a firm offer. Lionel Messi is understood to be a big friend of the Spanish international, and will make a move to keep the former Valencia man at Camp Nou. Luke Shaw is looking like a failed experiment at Old Trafford given his injury hell since joining from Southampton three years ago and will potentially be let go at the end of the season after the United hierarchy accept that he will never come good. United have been in stunning form since the beginning of the league season, racking up goals and offering defensive solidity to sit joint top at the summit of the league table alongside bitter rivals, Manchester City and Mourinho knows that a player of Alba’s quality will be welcome at the Theatre of Dreams. Alba is still number 1 choice at Barcelona under manager, Ernesto Valverde and only a mammoth wage offer could tempt the player into swapping Catalonia for Manchester. Alba is a left back that can also play further forward. He is widely recognized for his pace, technique, creativity and passing. He re-joined Barcelona from Valencia in 2012 after leaving as a teenager and has since made 208 appearances, scoring 9 goals and winning 11 trophies in that time. He will be a valuable addition to the United first team if signed and offer yet more quality going forward and won’t neglect his defensive contributions.